One of the more interesting aspects of international soccer is the way each national side has its own style of play. The most well-known is Brazil’s sauntering Seleçao (the select – their national team moniker). Said to samba as much as play soccer, they tend to ooze on-the-ball skill and cleverly execute tricks as they sashay down the field. Germany and Italy are both known for a defensive, physical style. Spaniards, like Brazilians, appear almost nonchalant when in possession, effortlessly passing the ball in high pressure situations in a way most can only achieve in practice. The English tend to seek a balance between the practical Italians and ever-skillful Brazilians. What of the US? If any international sport defines our collective sports consciousness, it’s basketball – the Dream Team. The LeBrons and Kobes display supreme skill but are also the most naturally gifted athletes on the floor. US Soccer can, as of yet, not make that claim. That’s not to say US players lack skill or athletic gifts. Quite the contrary. Each player on the national team is truly a world class athlete and, like their more famous NBA brethren, many of them excelled in any number of sports before deciding to focus on soccer. Charlie Davies was an All-American high school wrestler and Tim Howard was famously ‘drafted’ for the Harlem Globetrotters. But the USMNT does not yet have the same number of playmakers as the more famous international soccer teams. To play fluid soccer a side needs creative center midfielders (i.e. skilled dribblers and passers) in order to control a game’s ebb and flow. USA’s most imaginative players, Landon Donovan and Clint Dempsey, play as left/right midfielders or strikers. The center midfielders (see Player Profiles) are excellent players, but they tend to be physical and defensive. This means that against top competition the US must play more defensively than some fans would like to see. All teams, though, from the lowest club division to the top echelon of international soccer, must consistently seek a balance between individual brilliance and a unified team system. A typical US formation under Bob Bradley. Landon Donovan and Clint Dempsey's movement often turns the 4-4-2 into a 4-2-2-2. US manager Bob Bradley’s solution was to craft a 4-4-2 that allows the USA to maintain defensive discipline yet simultaneously make use of its most talented players, Landon Donovan and Clint Dempsey. Each US attack is determined by the runs of outside midfielders Dempsey and Donovan. Both have the freedom to move up the pitch or on an inward diagonal, and their teammates base their positioning on the wingers’ movement. The World Cup match against England illustrates how Donovan and Dempsey’s movement differs from that of traditional wingers, especially since England used a more conventional 4-4-2. Looking at the stat ‘passes received’ shows how the two gringos drifted centrally when the United States had possession. The two wingers switched flanks in the first half, which is why they received passes on both touchlines, but they also spent a significant amount of time in central areas. In contrast, England’s outside midfielders Shaun Wright-Phillips and Aaron Lennon stayed much wider. Wright-Phillips and Lennon never switched flanks and didn't move inward with any regularity. Of the four players, Lennon operated in the most conventional manner, staying high and wide to stretch the backline. Wright-Phillips did drop into his own half to participate in build-up play, but, again, he never strayed inside like the Americans. 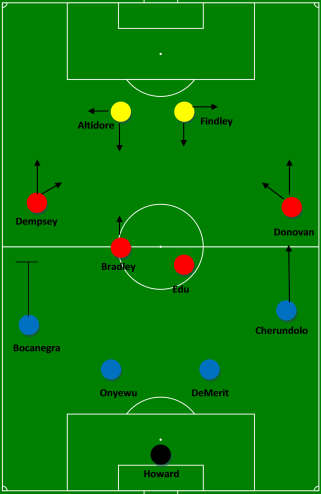 The fluid nature of Donovan and Dempsey’s movement forces their teammates to base their positioning on the wingers’ movement. If Donovan or Dempsey cut in, the striker on the corresponding side moves wide and the fullback pushes straight forward. Conversely, when an outside midfielder runs directly up the pitch, the fullback slashes inside and the striker remains in the middle, sometimes dropping closer to the center midfielders. The squad’s defensive system is quite traditional: maintain parallel four-man lines in midfield and defense, with one striker dropping back to the center circle to apply extra pressure. The other forward remains high in case an outlet pass is needed. Maintaining a rigid shape seems to be more important than individual man-marking, allowing for defenders to more easily make up for mistakes but sometimes leading to extended stretches in which the Americans have to chase possession. Unfortunately, the outside midfielders’ flexible roles do not come without issues. Indeed, their inward runs force strikers into creating service from the wings, not necessarily their strong suit. During a pre-World cup friendly Robbie Findley literally dribbled out of bounds on two separate occasions. This difficulty is somewhat negated by the finishing ability of Donovan and Dempsey. Both have spent significant portions of their careers playing striker and are capable of turning a lackadaisical delivery into a stunning goal. But no amount of skill can make up for poor positioning. Neither winger is a slouch in defense, but there are instances when their movement leaves them far from their defensive responsibilities. Consequently, when the fullbacks surge up the pitch the flank is vulnerable. 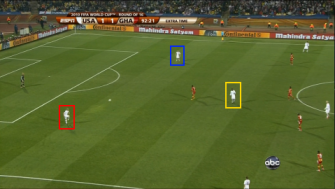 Center backs Jay DeMerit (red) and Carlos Bocanegra (blue) and center midfielder Maurice Edu (yellow) position themselves to make it difficult for opponents to apply pressure in USA's half. This dilemma is why Carlos Bocanegra is such a valuable asset. When he’s deployed at left back the United States essentially has three center backs on the pitch. Steve Cherundolo can then bomb forward from right back without worrying about exposing too much space. When Bocanegra is at center back, or on the few occasions he moves forward from left back, one of the center midfielders drops deeper and the two center backs move wide. Their width also serves an attacking purpose, as they provide an outlet pass along the flank. In essence, Bradley the Elder almost always has three players in the backline. As always, their roles are geared toward allowing the wingers to make full-use of their talents. The trio form a sturdy-enough base for Dempsey and Donovan to work their magic. Bradley’s 4-4-2 can’t always be called beautiful, but it has been quite effective. Under this formation the United States has excelled, appearing in the final of the Confederations Cup and winning their World Cup group for the first time in the modern era. Addendum: Check out our Tactics and the USA section for more info on how the gringos’ formation and style of play fit into modern tactical trends.